My sister, ‘The President of Cookies” has known me all my life. She knows that bacon themed products are an easy gift for this bacon lover. 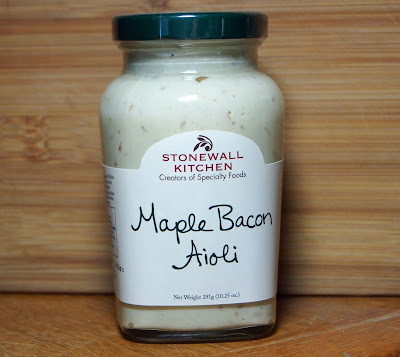 This Christmas she gave me a product from Stonewall Kitchens; Maple Bacon Aioli. I am no stranger to Stonewall kitchens with their other product; maple onion bacon jam. We are going to try this product straight out of the jar and with a prime rib sandwich. ( I was looking for an excuse to show off our aged prime rib roast we had for Christmas). Put on another yule log and let’s experience Maple Bacon Aioli. My first duty is took take a gander at the ingredient list. It has the usual suspects for a quality aioli with the added bonus of real, actual bacon bits. The one ingredient that disappoints me is ‘smoke flavoring’. (Liquid smoke). Liquid smoke can be genius or if heavy handed a curse. The top is opened to unleash smoky mayonnaise aromas. This smells fantastic. The texture is thick. This thick condiment is speckled with tiny flakes of real bacon. Here comes the million dollar question. How does it taste? I am in love with Stonewall Kitchens Maple Bacon Aioli. This is a quality mayonnaise type product with the added bonus of real bacon bits. I was worried that liquid smoke would be overpowering but this is not the case. It was used in restraint and is pure genius. The mixture is smooth, rich and a little decadent. I do have one small observation that is crucial. There is a little texture from the bacon bits creating a tasty and wonderful experience. This product is not perfect though. Where is the Maple? There is a little sweetness present but I could not identify it as maple syrup. Am I complaining? No, this is still a great product but does not deliver as promised. It is time to show off my Christmas roast.Aged prime rib roast baked in the oven would be the filling of our sandwich. This would be a great test for our bacon aioli. We added a little avocado to our sandwich and then topped it off with a generous dollop of aioli. Can words describe how wonderfully sinfully great this sandwich was. 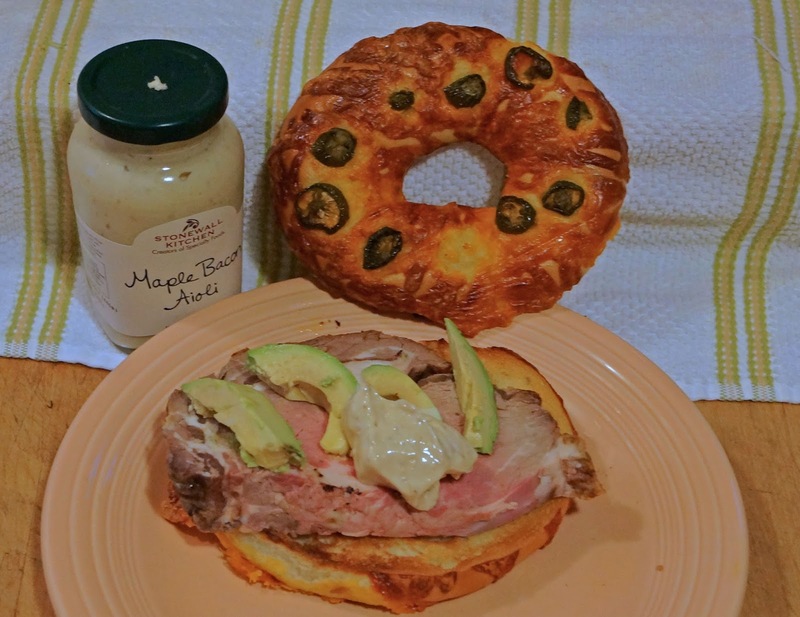 The aioli was the perfect accompaniment to compliment the avocado and beef. My next sandwich will definatly be avocado and maple bacon aioli. What a great product. It does not deliver maple, but, who cares. Brilliant. American Kobe beef, aged prime rib, you would think we are beefed out for the Holidays. That is not the case. We were on a mini meat adventure to pick up our prime rib roast and it was lunch time. 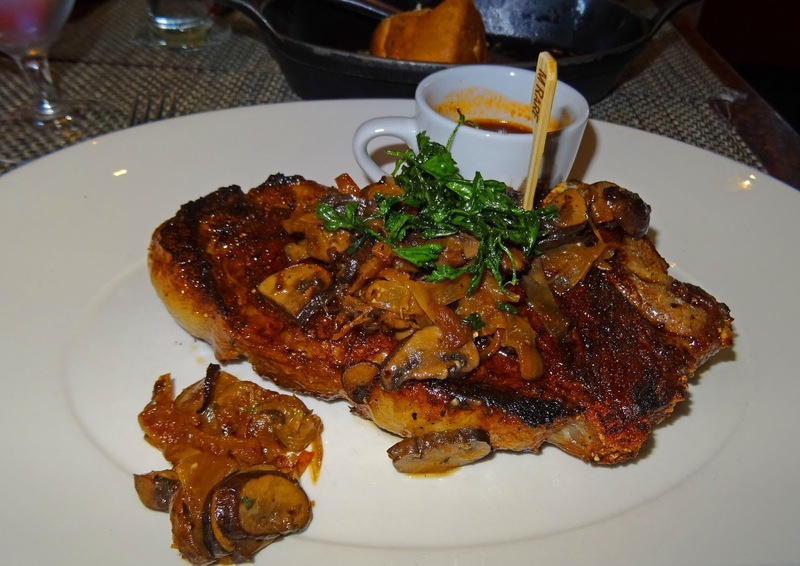 How about a steak at Stark’s Steak & Seafood? Stark’s is a restaurant that promises to be; “casually elegant with an upscale feel. “. 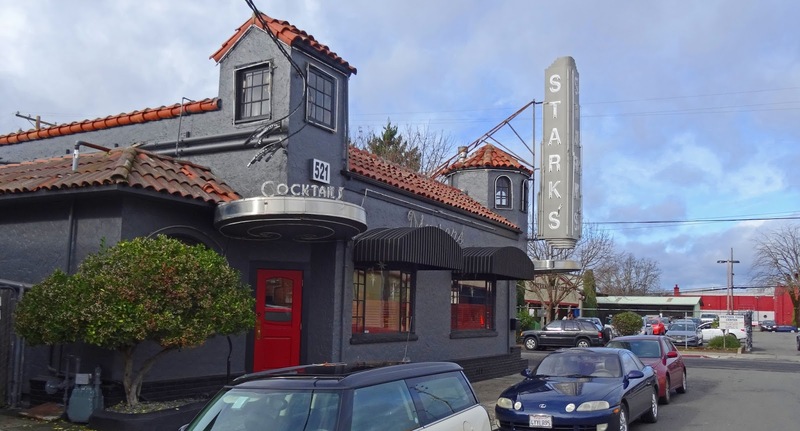 Stark’s is one of the six restaurants in the Stark’s Reality Restaurant group. As you know we love a good steak. On this adventure the ‘Great White Hunter’ was chaperoning. Parking Karma was in full effect because we parked right in front. The outside of Stark’s looks like it has some history. The feel and vibration is definitely from an older generation. The inside is elegant, modern and inviting. We are dinning at the noon hour. The main dining room is closed and lunch is being served in the bar area. Our pleasant hostess tried to seat us at a cocktail table until she felt the wrath of Ms. Goofy wanting a proper table. I was in total agreement with wanting a full table for several reasons. The Great White Hunter and I are large men who need a lot of room to maneuver and we were paying full prices for our dinning admission. We were seated properly and soaked in the ambience. The menu had the usual suspects of a high end steakhouse. 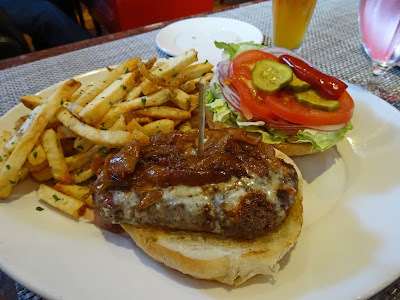 Aged beef, American Kobe, prime, seafood and even burgers were offered. Everything was a la carte. Our server asked us if we would like some bread. Need he ask? 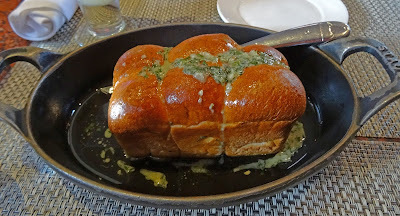 We were brought some butter and garlic with some bread on the side. This was a garlic lover’s delight. It is almost a week later and I still can taste the garlic. Since we were seated in the bar area Ms. Goofy had a micro beer. The Great White Hunter and I are teetotalers but the bar should be mentioned because it has a reputation of serving fun and tasty drinks. I had a bone-in 28 day dry aged ‘Prime’ New York strip steak. It was very tender and tasty. It was cooked to a perfect medium rare. It was seasoned very nicely. It was topped with a requested mushrooms and roasted onions. Was it the best steak I have ever had? No. This steak was very decent. Is it possible with all the quality steaks I have been eating recently that I have become jaded to steak excellence? I do not want to believe that but this steak did not ring any bells. The Great White Hunter and I split some sides of potatoes and creamed spinach. They both were rich, creamy and excellent. The Great White Hunter had the American Kobe. He enjoyed it but was not dancing in the aisles with praise. Ms. Goofy had a wonderful burger that she enjoyed. 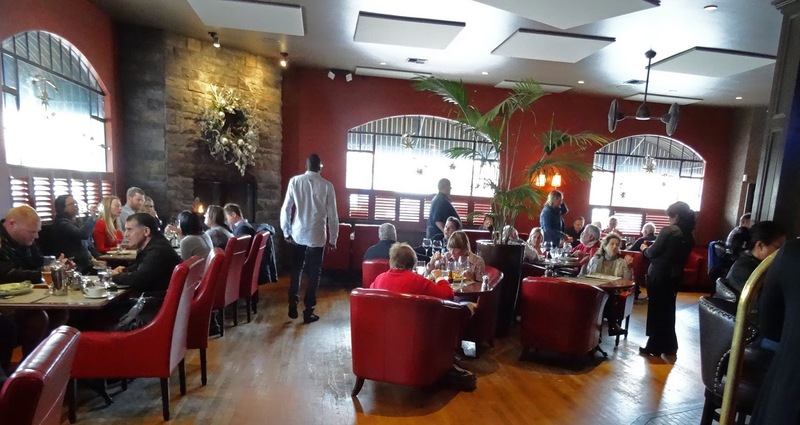 Starks is a very nice steakhouse. If we return it will be at the dinner hour to experience the main dining area. Starks has a wonderful atmosphere that is old and modern at the same time. Our servers were pleasant and efficient. The steaks were good and possibly great. Maybe I am just spoiled in eating quality steaks. Twas the night before Christmas and all through the house it smelled like barbeque T-bone steak. Ms. Goofy knows what I like. This present came by the Santa wearing a brown uniform and his sleigh was a delivery vehicle. This wonderful Christmas gift was a box of assorted steaks from Snake River Farms. Snake River sells American Kobe Beef. This is a very high quality beef sought after by chef's, bbq competitors and beef connoisseurs The marbling of fat throughout this beef is spectacular. This provides a luscious mouth feel in every single bite. I would suggest that the flavor has a feel of butter that is unique to this cattle breed. We could not wait till Christmas to sample this fantabulous meat present. A t-bone was enjoyed and savored by all. Ms. Goofy you are the greatest. Christmas is the time for Secret Santa gifts. I belong to a hot sauce group on social media. This group is of like minded Chileheads and hot sauce manufacturers. Every Christmas time we draw names and exchange hot sauce themed gifts. My basket which came all the way from Alabama had some home made Strawberry Reaper jam. The 'Reaper' pepper is a very exotic, extremely hot pepper. It is one of the hottest peppers grown. Including the reaper pepper with strawberry jam may be genius. 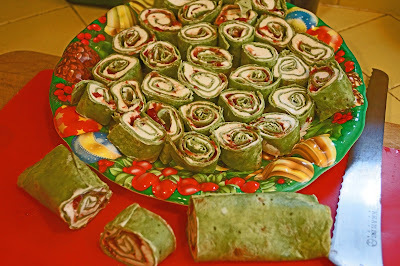 The sweetness of strawberry jam with the all mighty wrath of the reaper pepper will be perfect for our Holiday Christmas appetizer of pinwheel wraps. These are very easy to make. 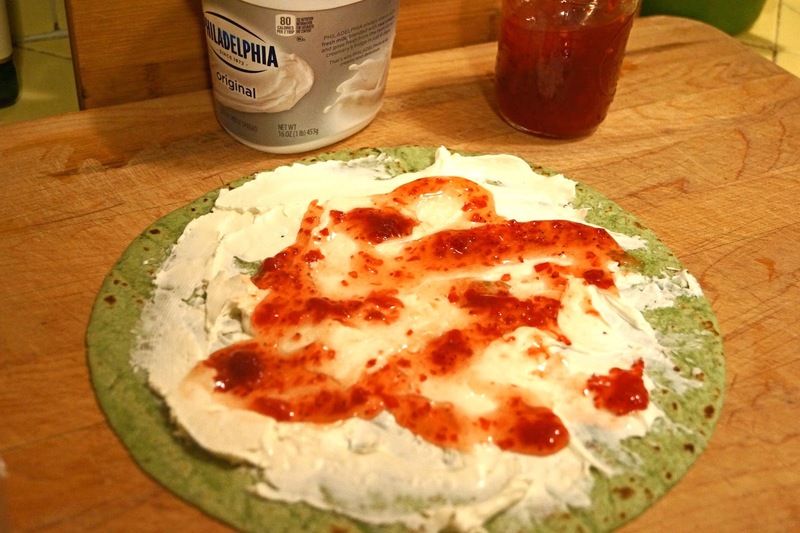 Spreadable cream cheese is spread over a green spinach flavored tortilla/wrap. Strawberry Reaper jam is then spread sparingly over the cream cheese. The tortilla is rolled into a cigar shape and wrapped in plastic wrap. An hour in the refrigerator firms this festive mixture. 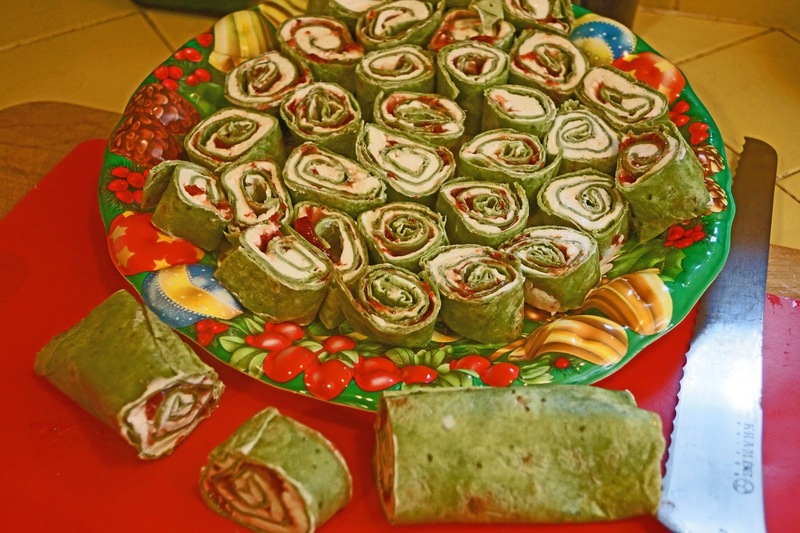 The rolls are removed of their wrapping and sliced into rounds. I loved them. The cream cheese and sweet strawberries were a perfect match to tame and compliment the fiery wrath of the reaper pepper. Ms. Goofy took a minuscule taste and proclaimed them too hot for her delicate palate. Her loss was my gain because these were not only festive with their Christmas colors but devilishly delicious. The holidays are here and that can mean only one thing. It is Christmas tamale time. Ever since I was a wee little Mad Meat Genius I have enjoyed tamales at Christmas time. My friend’s mom with help from the women relatives would make a plethora of different flavored tamales this time of year. Chicken, pork, beef and even a sweet tamal with brown sugar and raisins would be made. We would eat our fill and it was good. This time of year I like to recreate this childhood memory by making tamales with my own twist. We are making tamales with some smoked pork shoulder. This should be good. This was a project that took several days of preparation. The first step was to create the pulled pork. 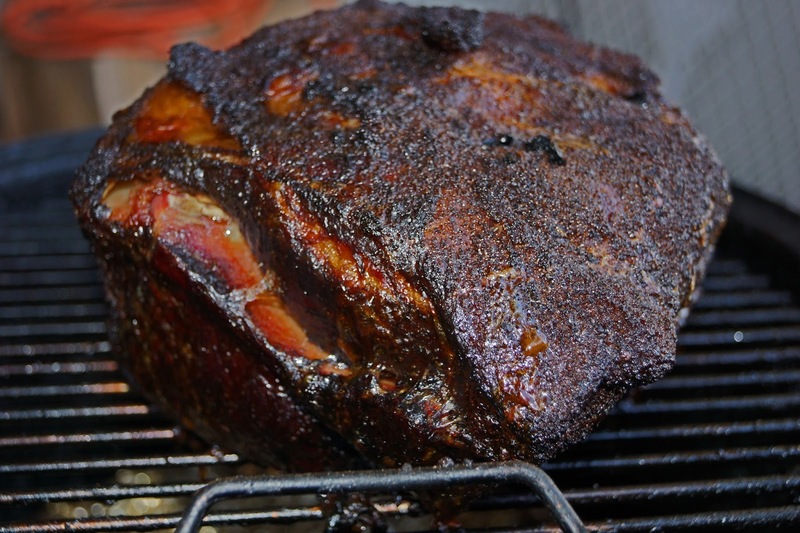 A beautiful pork shoulder was trimmed of fat and massaged with our rub of the day. An eight hour sauna bath in the smoker that was fueled by apple and hickory wood would do the trick. It looked gorgeous with a intoxicating smell to match. 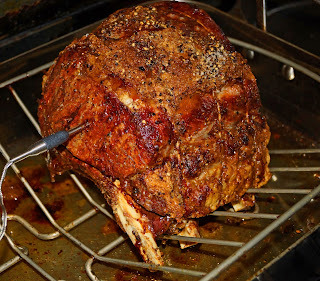 You know we had to give this roast a test ride with dinner that night. We had our fill with the added bonus of leftovers for the filling of our tamales. The next step was to get some fresh masa. We are lucky to be near plenty of Mexican markets. They carry fresh masa. They are sold in three pound packages and are very inexpensive. They also carried different masa flavored with chile peppers, strawberries and pineapple. This sounds very interesting.. This lit the light bulb in my noggin. 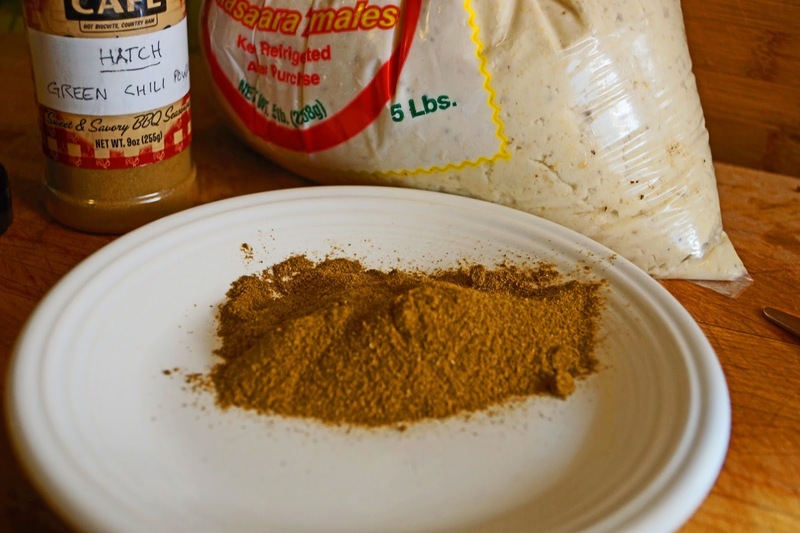 Why not flavor our masa with some chile powder. A friend gifted me some Hatch green chile powder. This might work. My first plan was to make a sauce to accompany and flavor the tamales. This sauce consisted of onions, tomatillos, roasted Hatch peppers, chicken stock and spices. These ingredients were sauteed in a pan until soft. The cooled mixture with the addition of fresh cilantro was placed in a food processor to be pulsed to a chunky consistency. Some was added to our left over pork adding another level of flavor. The rest was reserved to serve with the finished tamales. It is time to assemble. Corn husks were soaked in hot water to soften. We added Hatch chile powder to our masa. A husk is placed on the board. I used a measuring quarter cup to scoop fresh chile spiked masa to place on the husk. I spread the masa over the husk. A generous amount of sauce flavored pork was placed in the center. We rolled the husk to form a cigar shaped form. One end was folded up. Some people like to fold both ends and use a fancy tie to fasten the ends. I have learned from experience that this is not necessary. 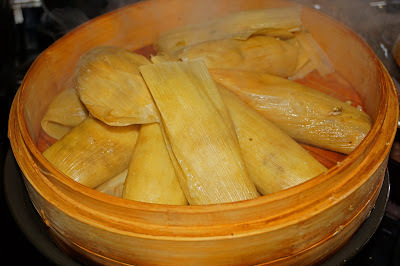 When you steam the tamales make sure the open end is elevated with the folded end on the bottom of the steamer. This works for us. We used a bamboo steamer to steam our little packages of fun. Forty five minutes later and it was time to eat. Ms. Goofy proclaimed these were the best tamale’s ever. I did not pay her to say that. (This time). She liked the meat to masa ratio which was heavy on the meat. The chile spiked masa was a nuanced flavor that was pleasant. These tamales did have a chile heat bite from the roasted Hatch pepper sauce and flavoring. We served our tamales with some homemade refried beans flavored with bacon lard. The filling of smoked pork was stellar. Oh my! This was a comforting and filling meal. We have created new Christmas tamale memories today. Porcus Infernum bacon flavored hot sauce from Voodoo Sauces & Salsa is on the table today. This is advertised as bacon in a bottle. This sounds like a wonderful combination of hot sauce and bacon. As some of you may know, I am a sucker for any bacon flavored product. Voodoo Sauces has my attention with bacon but so many times in the past I have been disappointed with bacon themed products and the promise of bacon. We have our fingers crossed today. Let’s go taste some Porcus Infernum. Water, apple cider vinegar, tomato paste, sugar, chile pepper blend, salt, spices, citric acid, ascorbic acid, bacon flavor, 0.5% of monosodium glutamate, hydrolyzed vegetable protein, artificial ham flavor are the listed ingredients. Can we say artificial ham flavor? I am not sure why that tickles my funny bone but it does. I am a little curious about the ingredient; bacon flavor. All that really matter is how it tastes. I smell bacon. It is a wonderful smell. It smells a little like holiday ham too. There is a back-up aroma of tomato’s. The aroma is pleasing to me. The texture is fluid and pours quickly through the opened top. There are no seeds or pulp present. An evil red eyed looking swine glares at the potential buyer of this sauce. A humorous description graces the side of this 5 ounce bottle. The label is eye catching and works for me. The million dollar question is; Does Porcus Infernum pass the bacon flavor test? I am going to answer with a resounding yes. We taste bacon like flavor. There is a pork essence that has a bacon/ham nuance. The salt presence grabs your attention just as a well balanced slice of bacon should. Tomato’s and pepper flavor cradles and compliments this bacon flavor. The chile is mild but contributes to the overall flavor mix. The apple cider vinegar adds a splash of freshness.This sauce is well balanced in all its components. We like it. There is no discernable heat but will give this a complimentary one star out of 5 on the heat meter. Bacon and eggs without the bacon almost sounds blasphemous. If for some crazy reason you do not actually have bacon on hand this sauce is a good stand-in for bacon flavor. It will never replace the real deal but is actually good in the bacon flavor department. 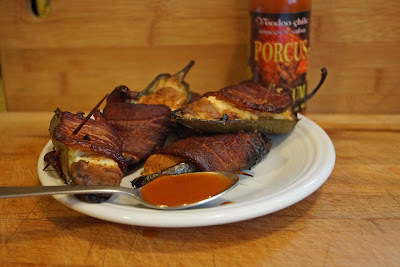 We tried some Porcus Infernum with some smoked stuffed jalapenos. “Winner, Winner, Jalapeno Popper, Dinner”. This was a fantastic pairing. The smoke, jalapenos and bacon with bacon sauce hit on all cylinders. Porcus Infernum will receive the Chilebrown seal of bacon approval. I have tried so many bacon themed products that have only mimicked and disappointed. Not today. 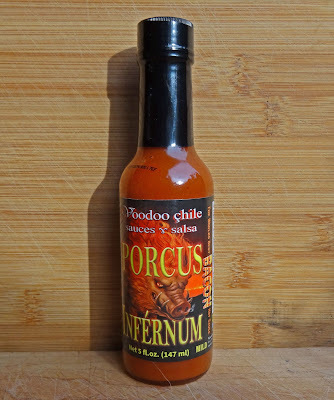 This is the real deal for bacon flavor. . Porcus Infernum will go with any dish in my opinion. Voodoo Sauces & Salsa motto is; “Voodoo Chile Sauces exists to entertain taste buds”. They have succeeded. Sometimes it is a good idea not to read the ingredient list. Maybe I do not want to know what ‘bacon flavor or artificial ham flavor is. All I know is that this is a mild bacon flavored sauce for the masses. Good stuff! Last night we went to a very nice Christmas party hosted by Harry Soo & Donna Fong. These two celebrity Pittmasters know how to throw a food extravaganza extraordinaire. 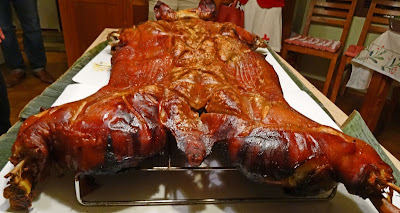 I just wanted to share an image of "The End' of a roasted whole pig that was one of the many dishes offered. The skin was cracklin with porky goodness. What a fun time. Take care of your grill and it will take care of you. A simple routine of maintenance will insure better performance and cooking results. 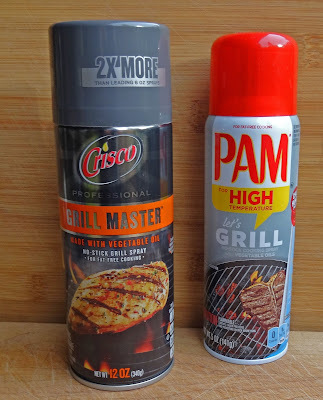 I am talking about cleaning and oiling your grill grate. This should be done before and after each use. 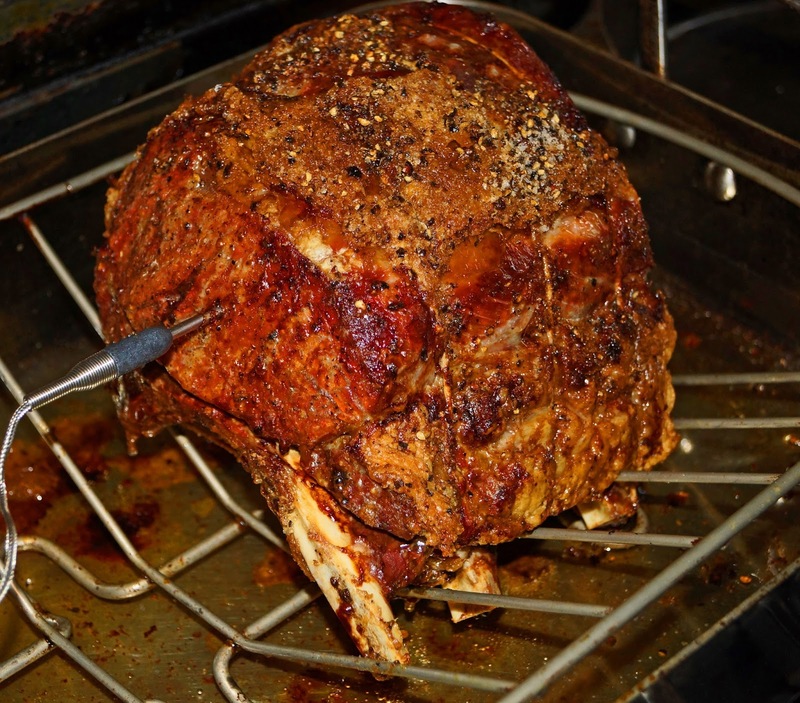 Once the grill is good and hot we will take a wire brush and scrape all burned or crusted meat matter off the grill. A light coating of oil will ward off rust and keep your grill ready for use. The oil can be applied by a simple rag coated with oil. Recently I have discovered the ease and convenience of oil in an aerosol canister. They can be found at almost any grocery store. The two canisters pictured were inexpensive. For some reason the Crisco brand was about half the price of Pam. The Pam contains a mixture of canola and cottonseed oil. It claims to be specially formulated for high heat use. The Crisco uses soybean oil and is a patented recipe. The both seem to work just fine and I cannot recommend one over the other. I just like the convenience. Here we go again. Bacon is cured by definition. If it was truly uncured you would be buying slices of pork belly. The truth is it this bacon by Llano Seco is cured by celery juice (celery juice extract has the same properties to cure as nitrates but is considered natural) and not nitrates. The Government in all its wisdom has allowed producers to use the misleading term ‘uncured’ when nitrates are not used. I apologize to start out this post with one of my pet peeves. Let’s try again. Today we are sampling some Llano Seco Uncured bacon. We procured this lovely specimen on our last Meat Adventure to Chico with our friend John Chips. We are going to make some stuffed jalapenos to give our bacon a try. Llano Seco is a farm in Northern California. They use a cross breed of Duroc and Berkshire. The hogs are raised in a pampered surrounding that can only be described by many politically correct buzzwords. This package contains 12 ounces, not a pound which has become an industry standard. They are sliced very thick and count out to eight slices. The fat to meat ratio is fair. The package claims the bacon is smoked by hickory and maple. The fat looks very creamy and smooth which is a characteristic of quality pork. We use this bacon to wrap some stuffed jalapeno poppers. Our stuffed jalapenos were cooked in a smoker for a couple of hours. The bacon crisped up very nicely. 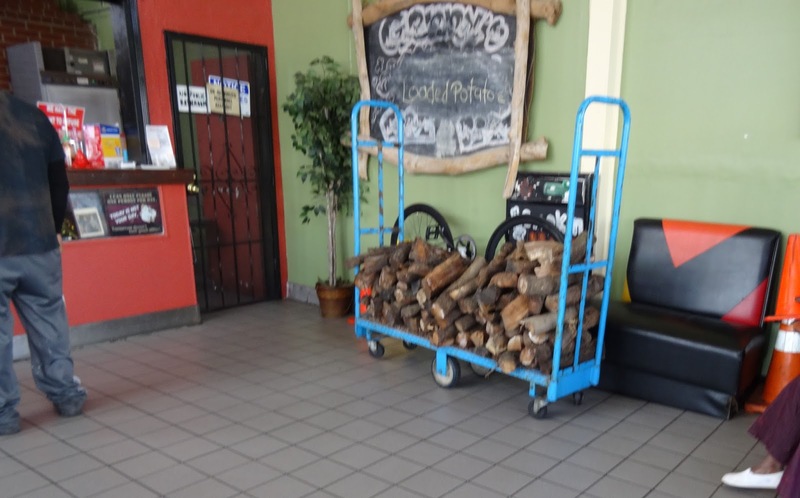 The smoke level was high but this most likely was from the hickory and Applewood that was used in the smoker. I did like the flavor of the pork. It had a mild beefy like taste that almost could be compared to veal. This is not your Wally-World variety of bacon. The cure of salt & sugar was in good balance. Overall this is quality bacon despite its misleading title. We enjoyed it. We are heading to East Oakland to experience ‘Genny’s BBQ Pit’. Ms. Goofy is away at her mud wrestling seminar so yours truly is flying solo. Oakland is my home town. While growing up we knew to avoid certain neighborhoods and Genny’s is located in one of them. Luckily my parking karma was on full tilt because a spot right in front was waiting for me. While exiting the vehicle I could not help notice the liquor store across the street with several security guards at their post. 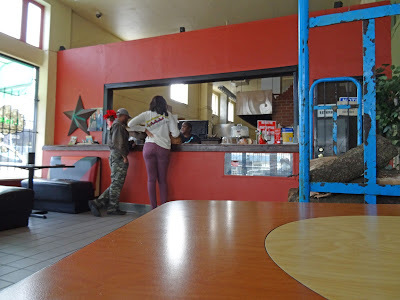 Safely inside was a small dining area with 2 ½ tables and a counter to place your order. This inside had a funky vibration. A little rundown with some storage items and stack of wood right in the center of the room was the scene. I will assume that Genny took my order. Genny took my order. She seemed to be in charge because she was barking out orders to her two assistants. 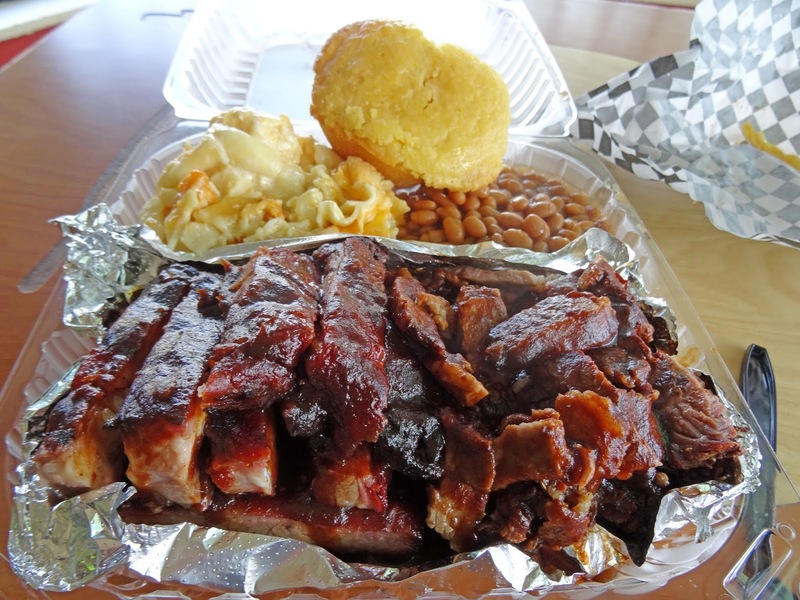 Ribs and brisket are my choices in a new bbq restaurant. Genny told me it would take an extra five minutes for my order. Let me paint a picture of the dining area. There were two booths that were occupied with a third table but with only one booth chair. I sat in my half booth and waited for my order. Twenty minutes later Genny motioned me to the counter to pick up my order. I rose and walked all of 15 feet when a gentleman (?) who appeared to have drunken his breakfast sat in my half a booth. Genny saw this transpire and immediately ordered her minions to get me a table and chair. Oh my! The bbq meal was plated in a plastic clamshell. This container was heavy. I do have to admit the proportions were very generous. 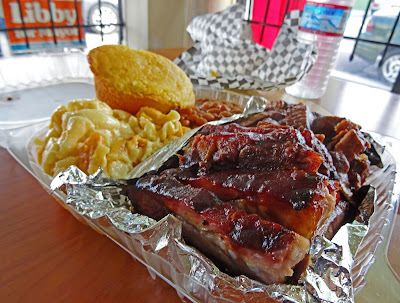 The ribs and brisket were served together in a foil lined section. They were hot and steaming most likely just out of the smoker. The brisket was thinly sliced and cut into chunks. The ribs were also creatively cut. There was some heavy cleaver action on these meats. Let’s start with the brisket. It was sauced with a molasses, tomato and possibly coffee based sauce. The sauce was not heavy handed. The smoke was good with its presence saying hello. The slices had a chew to them. Fat was a plenty on this toothsome offering of brisket. It was seasoned nicely with a chewy bark, emphasis on the chewy. The ribs were cut every which way. Each and every bite was a little different. These too had a chew and were under done in my opinion. Rib tips and bones were included in this offering. They were seasoned nicely and had decent smoke. I asked one of the assistants what kind of wood was the pile in the center of the restaurant. He replied: ‘It is either Redwood or Oak, I am not sure”. I personally hope it is the latter. The sides were decent. The cornbread was cakelike and the beans were on the sweet side. The highlight of this meal was the mac & cheese. It was full of processed cheese, warm, gooey, ooey and so full of comfort. Yup, I loved it. It was definitely an adventure venturing to Genny’s BBQ Pit. Chances are very good I will not return. This is not an authoritative or advice on steak knives but rather a questionnaire of sorts. What steak knives do you have or use? There are so many styles, variety and quality of knives. In the past I and certain relatives have been known to acquire steak knives with sticky fingers from unknowing restaurants. 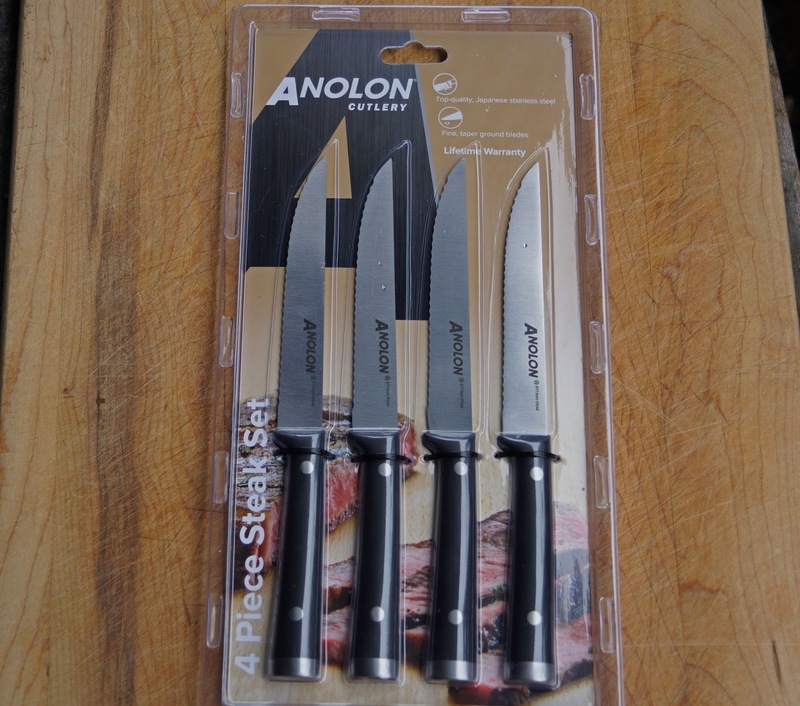 We have a set of steak knives in our silverware drawer that are dull as dishwater. 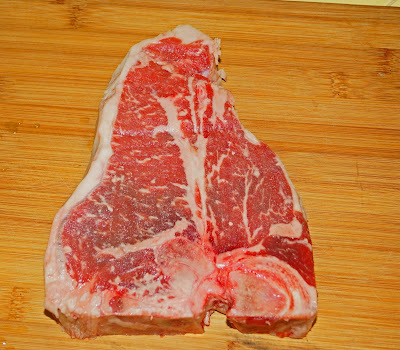 Luckily most of our steaks are tender and we have gotten by. 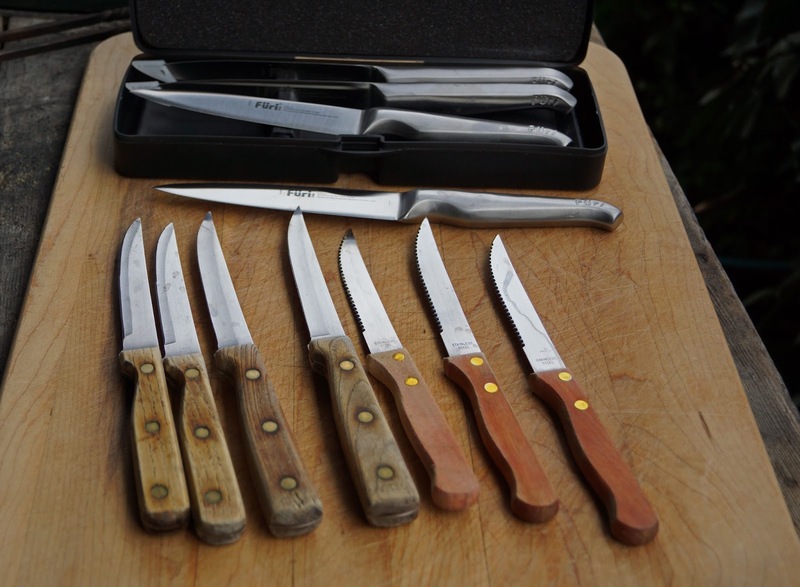 We do have a set of Furi Pro steak knives but they are in a case and we never seem to find them fast enough while the steaks are resting to warrant their use. I recently bought this inexpensive set of Analon knives. They were cheap enough to not need vigilante cautious care and will take their place in the silverware drawer until needed. What is your favorite steak knife?